Wales have been drawn against Italy and Serbia in the 2016 European Qualifiers for the 2017 Rugby League World Cup. Wales host Serbia on the weekend of 15-16 October and visit Italy on the weekend of 29-30 October. The group winners will qualify for the World Cup in Australia, New Zealand and Papua New Guinea, while the runners-up will go through to the play-offs. 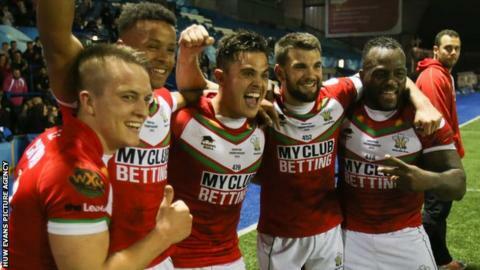 "Italy is probably the toughest draw we could have got," said Wales coach John Kear. "They've a lot of Australian Italian players to choose from and we know from 2013, where they beat both England and Wales, how well they can play. "We don't know too much about Serbia apart from the fact that they've had a good 2015 and have done well to qualify for this stage. "We won't underestimate anyone. We'll prepare well, like we have done for this year's European Championship, and we'll go into the World Cup qualifiers with a professional outlook. "If our players keep developing the way they are right now, there's no reason why we can't qualify then go down under in 2017 and make a good account of ourselves." Wales have lost both games they have played against Italy, 13-6 in a friendly in Wrexham in 2010 and 32-16 at the 2013 World Cup in Cardiff. In their only outing against Serbia, in 2009, Wales won 88-8 in Smedrevo. Wales face Ireland on Saturday in Bray knowing a win or draw will give them the European Championship trophy for the first time in five years.